“This document is the result of multiple meetings, discussions and outreach and the represents the consensus of the CURB Central Council,” the organisation said. 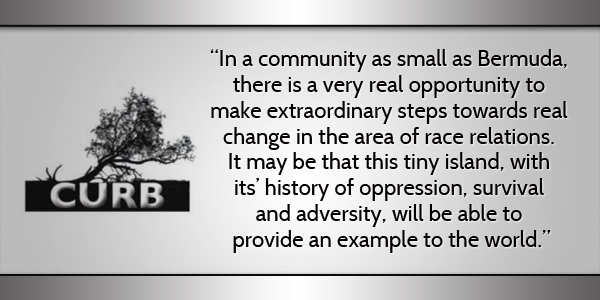 CURB’s platform begins by saying, “Bermuda’s struggles with racism represent a microcosm of what occurs in many countries elsewhere. “CURB members’ visit to South Africa in 2012 showed that although they have made strides in their truth and reconciliation process and social justice work, they struggle to confront the issues of white privilege and ongoing structural racism. “In a community as small as Bermuda, there is a very real opportunity to make extraordinary steps towards real change in the area of race relations. It may be that this tiny island, with its’ history of oppression, survival and adversity, will be able to provide an example to the world. “All Bermudians know that change is needed and as a society we must have the courage and determination to carry out a vision that enables us to heal and find a way forward in community. Big Change requires Big Vision. Some of these are okay. It’s a shame CURB has destroyed its credibility by standing up for immigration violators and advocating race based immigration policy. The hypocrisy undermines the message. I knew Trump supporters would have a fit. Racial problems require racial remedies. In terms of immigration, historical facts and statistics show 300 years of race based immigration policy. It is facts not rhetoric which informs CURB’s position or maybe you aren’t interested in facts and statistics. CURB advocated for discriminating against long-term residents using racial justifications. Reversing the direction of racial immigration policies does not solve anything, it simply creates a new problem. Progress will come from creating a level playing field, not disadvantaging another racial group. …and do what with Employment Tax?????? What’s the difference between an income tax and our current payroll tax? Do they want to tax profits of companies or just personal incomes? Would a graduated payroll tax accomplish what they are looking for? Only once they actually start calling it ‘income tax’ and figuring out all the logistics how to start collecting it as as separate by name tax. It’s called payroll tax and hospital levy . Both are percentages of what you earn and any doubt that they ARE income tax will be proved by the fact that they will vary based on your weekly earnings as they might fluctuate based on overtime earnings or a change in base pay . The economic items of this platform will end Bermuda once and for all. So I guess the system and recipients of economic and social status from 400 years of extortion is fine? … As if that doesn’t include you. Such a sweeping statement. Fortunately those in the financial industry believe in actions based on and revised according to measuring certain indicators. Without statistics they know they are flying blind so measuring is key. The culture/approach is one of logic and discipline not reactionary blanket statements. Much of what CURB is advocating is based on data or on collecting data. It is also based on the fact that social health impacts economic health. 1. Support for a reconciliation process – so the underlying question is who is responsible for what and who makes that determination and why? What is in the best interest of all? South Africa’s is not Bermuda’s experience. 3. Revival of a Workforce Equity Bill – “The bill, which could see employers fined for not promoting black Bermudians, has proved controversial.” It will always be controversial and is unlikely to be passed by any Government OBA or PLP because it like other Government policies which interfere in the running of the economy have the potential to scare off current and future investors. 4. 1% Mortgages through the Bermuda Housing Corporation, 3.5% Mortgages for Expanding Families – who pays for these and what are the conditions under which someone/a family would be elligible. 6. Establishment of a Necessity Goods Depot – this along with many other of the CURB proposals are advocating for an increase in the social state.Bermuda could never be a UK or European country in that regard – we do not have enough of a tax base even with increased taxes. 7. Capital Gains Tax on Houses over a Determined Annual Rental Value – see above. Those who chose to invest in houses with a high ARV do so becuase of the low/no tax status of the Island. 8. The Mandatory Reporting of Wealth by Race – to what end? So we can have a statistic to show what we already know? 9. Legalization of Marijuana – this is pretty vague response. 10. Repeal of Section 315F of the 2005 Amendment to the Criminal Code – unlcear what specifically this relates to? 20. Economic Intimidation – “However, today CURB hears multiple reports of economic intimidation committed against Bermudians.” Historical anecdotal information is hard to justify any investigation into a social justice issue. CURB you need to work on this. Stating it is a fact does not make it a fact. As in a court of law you would have to evidence to prove this. 21. Immigration Reform – CURB you are on a slippery slope here. You advoate for Immigration Reform yet you support an Expat in his appeal for a denial for work permit renewal application based on assumption and heresay. 22. Repeal of section 3 of the Incentives for Job Makers Act 2011 – you need to spell out what the consequences are of not doing so. Speculation and assumptions about the consequences of Section 3 are not facts. 23. The introduction of graduated income tax – will never happen. See 6 above. Bermuda is the antithesis of the kind of Social State that CURB is advocating for. 24. The creation of a Black History museum, library and research centre – to what end?If the museums that we already have and spend lots of money supporting are not representative of the Black population then lets look at changing those. 25. National Health Care – who pays for it? Again the UK/European model would not work here, is not practical due to the limited numbers of those who could support it through a tax base. Further regulation of the private health care system we have now is needed. 27. Reparations – more information needed. This is the most vague proposal. It seems a little late to be introducing their 2016 platform in November 2016. These are just meaningless words on a sheet of paper without more thought and explanation from CURB. You are correct ‘Onion’ – Bermuda needs more credibility than this from CURB. very strange organization would not give it any credibility at all I think we all agree on that by now. 1. Spend government money in an effort to help out struggling, Bermudians. This encompasses a slew of points, scholarships, living wage, healthcare, new insurance and so forth. 2. Create and enforce channels for reminding Bermuda of historic treatment of blacks. 3. Introduce income tax, wealth/inheritance tax in order to redistribute wealth and income. 4. Change laws to be more focused on how best to serve our community, rather than punish according to the traditional western ways. The issue that this faces is the simple reality of the situation in Bermuda: we’re broke. And to become less broke, we need to be attracting foreign investment. And there’s almost nothing in here that appears to help with that, but plenty of things that could antagonize it. The vast majority of pain and disenfranchisement felt by Bermudians at present is mirrored everywhere in the world – and in most cases it comes down to wealth inequality. That is the challenge we must solve – in a balanced manner. It cannot be punitive, or else that very necessary foreign capital will just go somewhere else. Put another way, I’m all for ensuring everyone gets more balanced pieces of the pie, but not if it means we chase away the cook. Legalization of marijuana? I thought everyone smoked. How many joints each would we be allowed? Rather than just pass on a wish list, CURB could actually be proactive and get some of these off the ground. Some of their members could begin writing a curriculum framework for Black Sudies and they could also begin a fundraising campaign to set up the Black History Library and Museum. Positive action, where possible, on their part is the key. I think you are missing the point….they want you to do all this stuff. I read it that they just want you to saty out of the way..
at present…bermuda as a whole need..require reconciliation.